The Dark Light Game: Which is the strongest force, darkness or light and love? Translated by Suzanna Maria Emmanuel with the guidance of CAEAYARON (KRYON) and HALISARIUS, PLEIADIAN CHIEF COMMANDER and one of the Great Leaders of the GALACTIC FEDERATION OF LIGHT SOCIETY. Namaste and welcome to the most enlightening and exciting ascension times ever. When you listen to the teachings of CAEAYARON (with Suzanna Maria Emmanuel), you will often hear CAEAYARON say that we are in the middle of a game, and that he is the Great Chess Master. 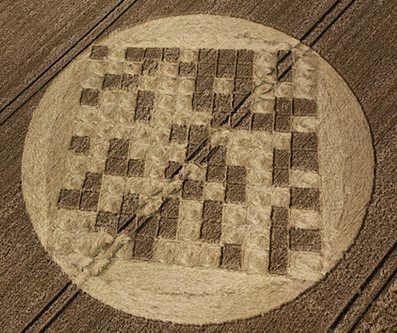 Over the last few crop circles, already the images show clearly we are in a spiritual battle, and here we are playing, light against dark, as we have been for an incredibly long time. We are in a game and the light is winning. In 2012 we won the first part of the test, which was, would sufficient numbers desire the love and the light back upon our plane? Because there were enough people desiring the great love, we were permitted by the Galactic Federations of Light to carry on, to allow the greater evolution to be discovered by us. In 2014 the greater gate to the higher information was opened, giving us clearer understanding of how to come into the love consciousness. In 2015 the Ascension gate was opened through the Divine Pineal Gland Activations of Caeayaron in New Zealand. In 2016 star gates were opened during pineal gland activations in Colchester England to enable the Pleiadians to heal and bring greater gifts to activated Star Sacred World Healers. This prepared the way for bringing in higher star DNA frequencies and greater team work between the activated and Pleiadian star beings. This will build in 2017 with the star healing grid being merged with the current healing grid of the pineal gland activated. The more people are activated, the greater the Sacred Violet Flame becomes upon the earth for increased transmutation of darker frequencies into light. CAEAYARON is certainly here allowing us to discover the greatest healings upon our plane, and he also describes the game like a chess board. The darkness, through cheating and breaching Galactic Laws, has had the play of the board for many thousands of lifetimes; trying its best to get rid of the light. It was only through the desire of the hearts that light could stay open on our earth. So many old souls fought for light to be on our plane. As light is stronger than all darkness, light won, though the numbers have always been much smaller for the light. The crop circle shows how the light is winning, as light is always stronger than darkness and darkness cannot exist where love and light exists in an equal playing field. The squares of darkness are losing fast now, and the light squared are gaining. If you look at the image, you can see some of the dark squares transmuting to light. It is interesting to note that the stronger groups of dark pieces are more solid, and the ones separated from the groups are weaker energetically as shown by corners missing off a few dark pieces. The game shows 79 squares of the light, versus 65 squares of the darkness. Given the chess board starts with 144 squared (72 white and 72 dark), this is 7 pieces down for the darkness and 7 up for the light. Seven is a spiritual number symbolizing looking beneath the surface, desiring truth and having it revealed. It is the time for greater information to come through to find our greater purpose so that we can move ahead into greater stages of evolution. The 'First Stage of Awakening,' was to help us understand spirit is real. Once sufficient numbers were gathered in the first stage, we could move towards the second stage; The Great Awakening,' where greater information is revealed to us for our greater choices to be made. The second phase of evolution is to find our love within and connect to many others in the love consciousness, for love is the strongest force in the universe and can conquer all when we are healed in the love of CAEAYARON, MAGNETIC MASTER. When we begin to listen to Great Divine Truth, we begin our true healing journey and the Love and the Light can truly live within us. No darkness can exist within us, within our thought systems, when we are healed in the great love of CAEAYARON and we become true love. Namaste, I send much love and light to you always, Suzanna Maria Emmanuel CAEAYARON’S Light Grid programmer and the designated channel for SOVEREIGN LORD EMMANUEL THE GREAT.